Thanks to everyone who entered my season pass giveaway and helped spread the word. We have our winners! Congrats, friends! Since all three winners use Twitter, I have just DMed the download codes. I hope everybody enjoys Lara's next DLC adventure, The Path Home, available tomorrow. The final DLC pack, The Path Home, is set following the end of Shadow of the Tomb Raider, after the dust has settled and the battle is over. It is only available to Season Pass holders. Just fill out the questionnaire below (or visit https://www.surveymonkey.com/r/PathHome) for a chance to win a Season Pass download code for the platform of your choice. Winners will be announced Monday, April 22. The Path Home launches April 23. Good luck! 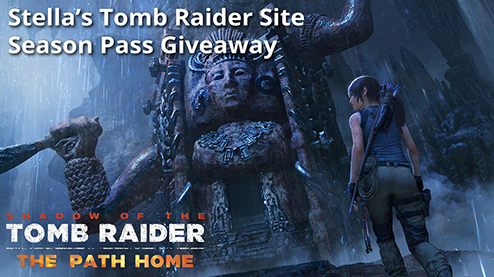 If you haven't tried Shadow of the Tomb Raider, the third installment in the reboot trilogy, here's your chance. An extended demo, which includes full access to the game's early levels, is now available via Steam, the Microsoft Store, the PlayStation Store, and Xbox Marketplace. If you're already playing or finished the game back in September, note that the first major downloadable content pack, The Forge, was released November 14. It includes a story mission and challenge tomb, as well as a new skill, outfit, and weapon, plus 5 achievements/trophies. The Forge also introduced co-op play, Time Attack, and Score Attack modes. The second DLC pack, The Pillar, will debut December 18. Both are available separately or as part of the Season Pass. Five more DLC drops will follow in the coming months. Stay tuned for details.